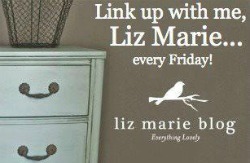 Welcome to the link up with my, Liz Marie Linky party! favorites that were linked up…. I’m loving party one of this kitchen re-do from Dear Emmeline. at the full post to see the beautiful side of this piece! recipe… & I want to try it now! a while now! What a lovely way to update a lamp shade! head on over to the full post to see the amazing transformation! This up-cycled desk from Crafty Scrappy Happy is dreamy! I’m loving the stripes! 2. Link up all your recent blog posts. 3.Visit some other posts that were linked up & leave them some love! 4.Share the party button on your post or in the sidebar. 5. Tell all your friends about the linky party, the more the merrier! Thanks for your ideas. One thing we’ve noticed is the fact banks and financial institutions really know the spending routines of consumers plus understand that many people max out their credit cards around the vacations. They prudently take advantage of this particular fact and start flooding your inbox along with snail-mail box using hundreds of no-interest APR credit cards offers shortly after the holiday season concludes. Knowing that should you be like 98 of all American public, you’ll hop at the possiblity to consolidate credit debt and switch balances towards 0 rate credit cards.